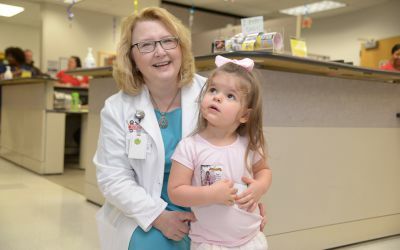 Reagan DeLoach with Pediatric Neurosurgeon Laurie Ackerman, M.D. When Seth and Kata DeLoach from Newburgh, Ind., welcomed their newborn daughter Reagan in October 2013, all they noticed was how beautiful she was. “Being first-time parents, you think your child’s perfect,” recalls Seth. But when Reagan was 2 months old, the family’s pediatrician, Julie Hurlock, M.D., expressed concern about the size and shape of her head. Reagan was referred to Pediatric Neurosurgeon Laurie Ackerman, M.D., at Riley Hospital for Children at Indiana University Health. Dr. Ackerman quickly pinpointed the problem: craniosynostosis. 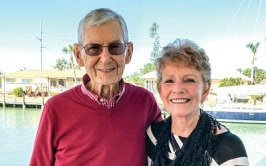 Dr. Ackerman assured the family that even though their baby’s head felt strange and swollen to them, she was healing normally, and they were well-equipped to care for her. Today, going on 3 years old, the only thing startling about Reagan’s appearance is how beautiful she is. With almond-shaped dark brown eyes and a sweet smile, she has drawn attention from a modeling agency. For now, her family’s focus is on watching her blossom and sharing their story with others, including Walmart colleagues, to encourage support for Riley Hospital.